Acrostic from Genealogy of Adam to Moses. "The Names Code: Adam to Jesus"
To view on this site: "Main Page of Bible-Names Code"
70 names from Adam to Jesus are sequentially read! The following is an example of an acrostic in English for demonstration purposes only. Let us pretend that the following names are those of your father, your grandfather, and so forth. Observe how the first letter of each name when read down the list combines to read, "JESUS IS LORD!" The bible acrostic is composed the same way. 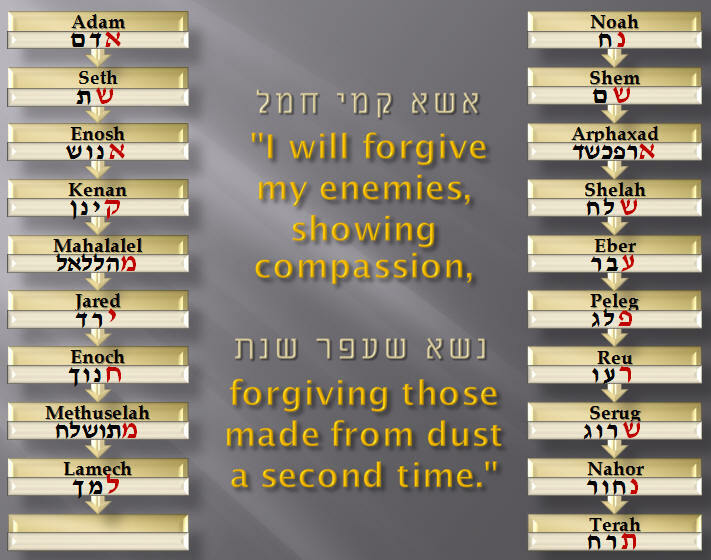 The first letter of each consecutive Hebrew name from Adam to Abraham (a total of 19 names) reads, "I will forgive my enemies, showing compassion, forgiving those made from dust a second time." The three columns of names are from the bible's genealogy of Moses, as recorded in Genesis 5, Genesis 11, and Exodus 6. The last three names are recorded in 1Chron. 26:25. The acrostic forms 10 words in Hebrew. (In the chart, the acrostic-formed words are separated by different colors.) Each column of names also has 10 names (if Noah is counted twice, which is what the actual genealogy apparently does, Gen. 5:32, 6:9). The symbolic use of "ten" to complete something is consistent with the use of "ten" in the bible, especially to do with Moses. 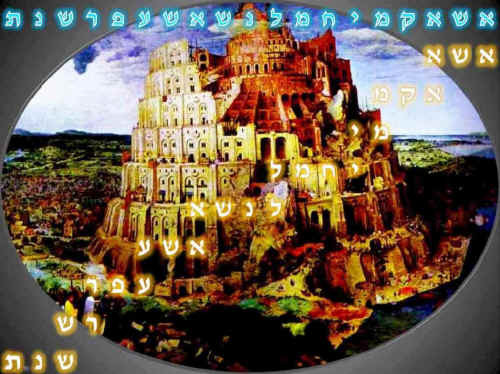 For example, "The ten plagues" upon Egypt, and "The ten commandments"; (literally, "The ten words", הדברים עשׂרת). As a matter of fact, Moses led the Israelites out of Egypt on the very same day of the "tenth plague". It is interesting that the last name in the genealogy that the acrostic uses is "Jeshaiah", which is a variation of the name "Jesus", (Yeshua). Moses is therefore a shadow and type of Yeshua. We are forgiven and saved, not from Egypt, but from sin and ultimately this world, and the "world" is what Egypt symbolizes. It is in this sense that God will "forgive" and "save" "a second time". The first was by Moses, the second by Yeshua! For we are all God's "enemies" by nature, for all have sinned. The salvation that forgiveness brings is by faith in God's Savior. As the acrostic says: "I will forgive my enemies, having compassion, forgiving those made from dust once again!" Rom. 5:10 "For if, while we were enemies, we were reconciled to God through the death of his Son, how much more, having been reconciled, will we be saved by his life!" Rom. 11:26 "In this way, all Israel will be saved..."
Rom. 11:28 "As far as the gospel is concerned, they are enemies for your sake, but as far as election is concerned, they are loved because of their ancestors." "So all the generations from Abraham to David were fourteen generations, and from David to the deportation to Babylon were fourteen generations, and from the deportation to Babylon to (Jesus) the Christ were fourteen generations, " (Matt. 1:17). In the case of every descendent from Abraham to Jeshaiah (1Chron 24:21, 26:25), the firstborn son is passed by in God’s choice of descent. (Rehabiah was an only son, 1Chron. 23:17). An unlikely exception might be Amram, (Ex. 6:18), unlikely because often the more important name was given first in a list of brothers, (rather than by age), as was the case with Shem and Abraham, (Gen. 5:32, 11:10; 11:26, 11:32, 12:4). Thus, to follow the line of Eliezar in the acrostic instead of Gershom (Eliezar’s elder and only brother) is to follow the pattern laid before it of rejecting the first born. There is also another acrostic code found in the parallel ungodly line of Cain. It contains 8 names and reads, "I will choose a circumcised people for myself (i.e., Jews), even (many) peoples for myself (i.e., Gentiles)." An acrostic is a type of bible code. Psalm 119 is a classic example of an acrostic in the bible. 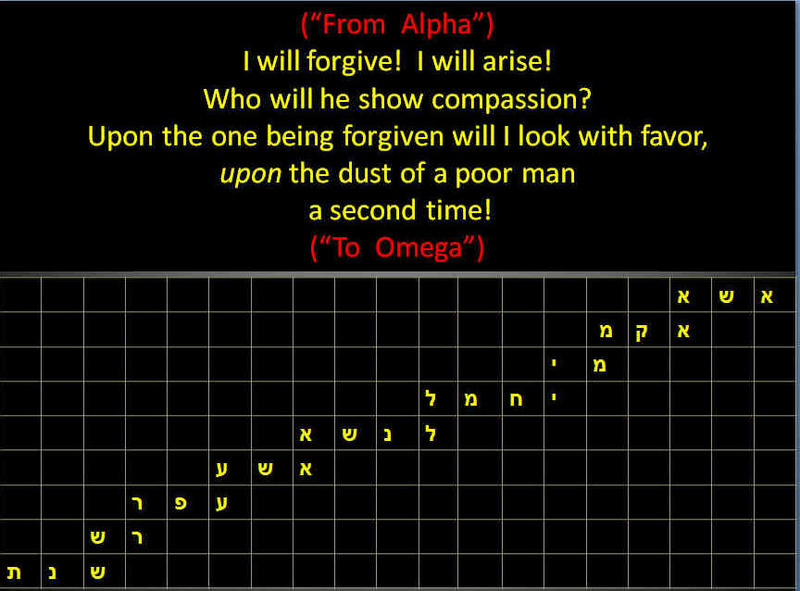 The first letter of each series of sentences move successively through the Hebrew Alphabet. (Also true of Psalm 9, 10, 25, 34, 37, 111, and 112.) These are obvious acrostics. However, there seems that there is a secret acrostics in the bible as well. This article explores one of those 'hidden' ones --- hidden for 4000 years! The acrostic summarizes the plan of salvation from the beginning of time. This hidden acrostic is derived from the first three genealogies recorded in the bible, (Gen. 4, 5, 11). The first two genealogies overlap in that they both begin from Adam. The first is the genealogy of Cain's line (the ungodly line) whereas the second is the genealogy of Seth (the godly line). In the first genealogy, the first letter of each of the consecutive 8 names are read in order, and this is again repeated in Seth's line all the way down to Abraham's father, Terah. A good knowledge of the first chapters of Genesis (where these genealogies are located) are essential to understanding what the acrostic means, particularly the creation and fall of man and the rising up of Cain against Abel and killing him. Also note the call of Abraham (Abram) out of Babylon as a chosen race of people and as a father of many peoples (nations), (Gen. 17:4,5,16; Josh. 24:3). From Adam comes two lines of decent through his sons Cain and Seth. The acrostic for Cain's line begins with Adam and ends with Jabal, and the acrostic for Seth's line also begins with Adam but ends with Terah and with his son, Abraham. (For Abraham, see long version of the code.) These two parallel acrostics refer to four incidents in the bible, and these four incidents happen to occur at either end of the two lines of decent! The acrostics refer to the time of Cain and Jabal, and to the time of Adam and Abraham. Thus, the acrostic refers to incidents in the history of man that occur at either end of the acrostic's genealogy, and this in turn is applied prophetically to Christ. If the acrostic were somehow the work of inconceivable random chance, the bible prophecy code would not also produce logical sentences that capsulate key events in the two lineages, and each at either end of the genealogies, and then soundly apply them to Christ who ultimately completes the genealogy! ...the son of Enos, the son of Seth, the son of Adam, the son of God." (Luke 3:23,38). Serug ¯ a second time. "I will choose a circumcised people, even peoples for myself!" having compassion, forgiving those from the dust a second time!" This first line of code is actually two harmonious readings joined together. (The bible code can read slightly different depending on where one separates the letters that form the last two Hebrew words.) It can read as, "I will choose a people, my circumcised ones! ", or, "I will choose peoples for myself!" Thus I understand it to read together as, "I will choose a circumcised people, even peoples for myself!" This opening sentence is very interesting given the very purpose of the genealogical record. The genealogies were meant to document the lineage of the chosen seed! (Gen. 3:15; 17:4,5,16). Thus, the acrostic addresses the very purpose of the genealogy at its offset. What is the purpose of the genealogical record? The acrostic answers this very question by a solemn declaration from God: "I will select peoples for myself (from a descendent)!" Intriguingly, the last letters of the same first four names contains another acrostic that reads, "from a descendent!" The first line of the acrostic reads: "I will choose a circumcised people, even peoples for myself!" This is a clear reference to Abraham, the son of Terah. Abraham (and ultimately Christ) is that descendent whom God would call forth "a circumcised people", for he is called "the father of the circumcision, and of the uncircumcised," (Rom. 4:11-12). In agreement with the code, God promised Abraham that a people and peoples would come forth from his seed. "And God said unto Abraham, As for Sarai thy wife, thou shalt not call her name Sarai, but Sarah shall her name be. And I will bless her, and moreover I will give thee a son of her: yea, I will bless her, and she shall be a mother of nations; kings of peoples shall be of her." (Gen. 17:15-16). "...that he might be the father of all them that believe, though they be in uncircumcision, that righteousness might be reckoned unto them; and the father of circumcision to them who not only are of the circumcision, but who also walk in the steps of that faith of our father Abraham which he had in uncircumcision." (Rom. 4:10-12). Therefore, the "peoples" spoken of in the code refer to both Jews and Gentiles. This opening sentence is encoded within the ungodly line of descent ---those of Cain who were "driven out from the presence of the Lord", (Gen. 4:14, cf., Job 18:19 in Hebrew). The fact that this first sentence is encoded within the ungodly line of descent (who perished in the flood) rather than in the godly line implies something important: It implies hope to lost men. It seems to indicate that the ungodly line of Cain is symbolic of the gentile seed in general (i.e., non-Jews) who were cut off from God and separate from the chosen seed (of Abraham) until the time of Christ. Thus, whereas the godly line represents the elect seed unto Abraham, to David, and then on to Christ; conversely, the ungodly line of Cain apparently represents the alienated seed. "I will forgive them that rose up against me,"
Ironically, what one would expect to be encoded within the line of Cain is instead encoded within the godly line of Seth and what is encoded within the godly line of Seth is instead encoded within the ungodly line of Cain! For the bible records that it was Cain that "rose up against his brother and slew him", (same Hebrew word as in code, Gen. 4:8). This implies that the godly line ultimately are no better off than Cain and that both people groups are in desperate need of forgiveness --- both Jew and Gentile! "What then? are we better than they? No, in no wise: for we before laid to the charge both of Jews and Greeks, that they are all under sin; as it is written, There is none righteous, no, not one; There is none that understandeth, There is none that seeketh after God; They have all turned aside, they are together become unprofitable; There is none that doeth good, no, not, so much as one: Their feet are swift to shed blood;" (Rom. 3:9-12, 15). The statement that "I will forgive them that rose up against me" also implies that Jesus is like righteous Abel. Abel was slain by His brother Cain in the same way Jesus was slain by His brethren, the Jews. "...having compassion, forgiving (or "lifting up") those of dust a second time!" Three times in this short acrostic bible code God emphasizes pardon: "I will forgive..." "having compassion," "forgiving". 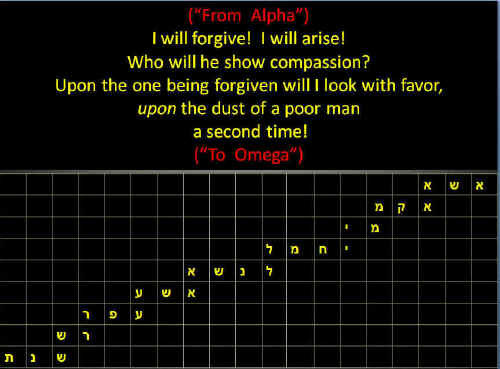 The acrostic declares that Adam (which in Hebrew means mankind) will be forgiven a "second time". What does "a second time" mean? And if there was a "second time", when was the first time? The 'first time' that God 'forgave' appears to refer to a combination of events as if all were part of one transgression. The code alludes to the original fall of Adam and also to the transgression that followed that, namely to when Cain killed his brother Abel. The reference in the code to "...forgive the one rising up against me", links it to Cain (as previously explained), whereas the reference to "forgive the one who is of dust", links it to Adam since he was formed from the dust. Only God could speak so full with meaning, and this further attests to the veracity of the bible code. Cain's short genealogy begins with a reference to 'vengeance rendered seven times' and ends with Lamech, (seventh from Adam) and vengeance "seventy-seven times". This reference to "seven" and "seventy-seven" links the text to Christ, whom the bible calls the "last Adam", (1Cor. 15:22, 45). Note the stark contrast between the vengeance of Cain with the forgiveness of Jesus, (keeping in mind that "forgiveness" is the theme of the code). It is also interesting that Luke's genealogy (that spans from Adam to Jesus) also contains 77 names! As for Adam, in a figurative sense, God "forgave" Adam 'the first time' by covering his nakedness with a slain animal, (Gen. 3:21). This slain animal was the first blood ever shed and is a type of the sacrifice of Christ who hung naked on a cross, and Abel likewise is a type of Christ, whom Cain slew. Figuratively speaking, this is the 'first time' that God forgave mankind and points to ultimate '"second time" when Jesus was lifted up on the cross to die naked so that man might be clothed with His righteousness. Thus, the first forgiveness of Adam pointed to and illustrated the second forgiveness of man when Christ died so that the first forgiveness might be validated. "For without the shedding of blood there is no forgiveness of sins", (Heb. 9:22). "I will be lifted up by those who have risen up against me..."
having compassion, lifting up those (low in) the dust a second time!" Now it happens that the common euphemism used in the Gospels to describe Jesus' death by crucifixion is that of "being lifted up". This code was written about two thousand years before Christ, and to my knowledge only now discovered in our day 4000 years later! This in itself, I believe, is a sign that God will soon reclaim His people Israel to Himself by turning them from their sins by their acceptance of Jesus (Yeshua) as Messiah. Moreover, the 70th jubilee (i.e., 70 x 7 x 7 years) from when Israel entered the Promised Land occurs within a couple of decades from now. "The Names Code from Adam to Jesus"
An amazing prophecy emerges when all 70 names from Adam to Jesus are read sequentially! "I will forgive! I will arise! Who will show compassion? Upon the one being forgiven will I show favor, (even upon) the impoverished dust a second time." Or it may read slightly different as below.